The number of people affected by humanitarian crisis and natural disaster is growing by the day. An unprecedented 65 million people are forcibly displaced, either internally in their own countries or seeking shelter across borders. Among them, ten million refugees are under the age of 18. These events have multiplied over the last ten years, just when the planet has reached its all-time temperature records, blurring the difference between human-made and purely natural catastrophes. It all sounds dire, but alongside these challenges, other, positive trends are rising. Groups and individuals—volunteers from all backgrounds—are effectively responding to humanitarian emergencies everywhere. They are regular people who, in the face of human suffering, don’t hesitate to rapidly descend to the affected areas and help however it is needed. Recognizing these trends, I am pleased to launch the campaign for International Volunteer Day 2017, “Volunteers Act First. Here. Everywhere.” We want this day, 5 December 2017, to be a recognition of volunteer efforts around the world, as well as a tribute to the support volunteers provide in times of instability, disasters or humanitarian crises. Volunteers are the first to respond when crisis strikes. They are there to rebuild the most essential infrastructure, especially housing, electricity and healthcare services. Volunteers arrive first because they are themselves members of these communities, and driven by a spirit of solidarity and a desire to contribute to the well-being of others without expecting anything in return. During the last few months, volunteers have been present offering essential support in countless humanitarian catastrophes worldwide. Over the past decade, over 1.5 billion people have been affected by disasters. Groups of volunteers not only rushed to rescue victims in Mexico, but also provided much-needed psychological support to families whose houses were damaged during the recent earthquake. And after Irma caused massive destruction across the Caribbean, the International Federation of Red Cross and Red Crescent Societies (IFRC) deployed volunteers to provide assistance to people being evacuated. In Cuba, for example, more than 11,000 volunteers are providing assistance and supporting debris-clearing activities. Increasing migration is both a cause and a consequence of some of the most significant humanitarian challenges of modern times. Volunteers help respond to the humanitarian and protection needs of migrants and displaced people by providing life-saving services to the most vulnerable. In Bangladesh, where more than 800,000 Rohingya refugees from Myanmar are gathered in informal settlements and camps in one of the region’s largest man-made humanitarian crises in decades, Bangladesh Red Crescent Society volunteers are on the ground doing all they can to support people as they arrive. And off the coast of Libya, volunteers have helped rescue hundreds of migrants from their perilous journey across the Mediterranean Sea. In Syria, volunteers continue to play a central role in relief efforts and the logistical support needed to alleviate the plight of residents. More than 300 highly-experienced UN Volunteers are serving in countries neighbouring Syria, such as Jordan, Lebanon and Turkey, delivering lifesaving services for the UN Office for the Coordination of Humanitarian Affairs (OCHA), improving the efficiency of the overall humanitarian effort in the border and providing education to refugee children in host countries. Around the world, hundreds of thousands of volunteers work in communities to promote health, prevent diseases and respond to the basic needs of people affected by drought, poverty, conflict and the lack of resources to sustain agriculture, some of them facing mass starvation. In northern Nigeria, where millions are suffering from food insecurity, the World Health Organization (WHO) in partnership with the local government has been able to deploy 14,000 volunteers to vaccinate 1.9 million children against polio. And after a surge of cholera cases in war-torn Yemen, community health volunteers raised awareness of the dangers posed by the disease. 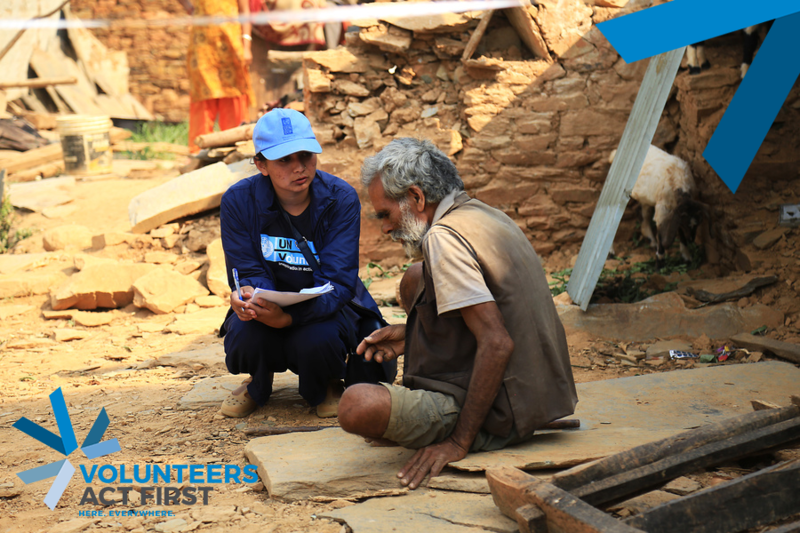 Investing in volunteers and joining forces across the United Nations, governments and volunteer-involving organisations to prevent the worst effects of crisis can bring much-needed relief to those who suffer the most, and assure that needless suffering does not repeat itself. This year’s International Volunteer Day (IVD) campaign is supported by volunteers and organizations, such as the International Federation of Red Cross and Red Crescent Societies (IFRC) and many others that respond to humanitarian emergencies everywhere. Join us starting today, and up until IVD on 5 December in recognizing the efforts and positive solidarity of volunteers who answer calls in times of need, helping save lives today and supporting those who want to continue living their lives with dignity tomorrow. #VolunteersActFirst. Here. Everywhere. --- This story has been originally published in the Huffington Post as part of the campaign for International Volunteer Day 2017: Volunteers Act First. Here. Everywhere. Mr. Olivier Adam is the Executive Coordinator of the United Nations Volunteers (UNV) programme.